These days, thru hikers and weight conscious backpackers are spoiled for choice when it comes to lightweight backpacks on the market. 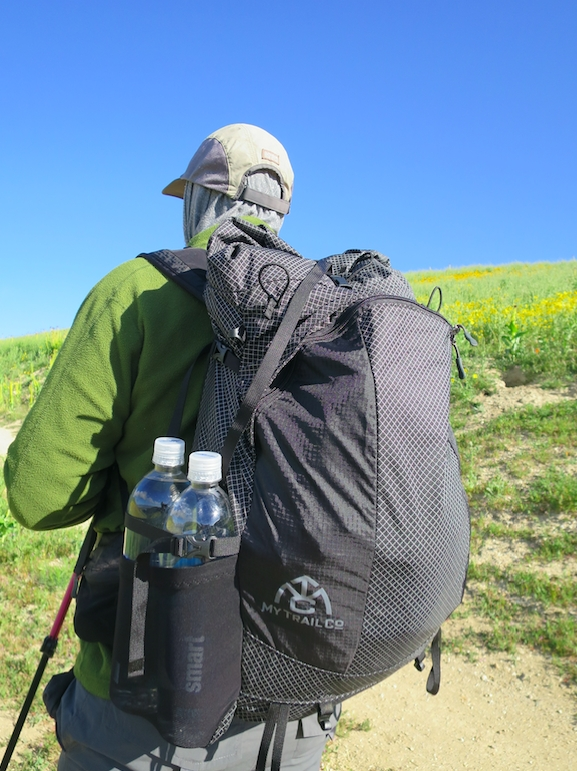 With Ultralight Adventure Equipment (ULA), Mountain Laurel Designs (MLD), Hyperlite Mountain Gear (HMG), ZPacks, Gossamer Gear, and others selling backpacks weighing ~2 pounds or less, you’re likely to find a pack that is right for you. However, most of the packs sold by the companies above cost between $200 and $350. The My Trail Co Backpack Light 50L on the other hand, is a lightweight, durable, comfortable pack that won’t break the bank. It is certainly worth your consideration. This pack weighs 33.5 ounces. It is built to fit the needs of ultralight hikers without sacrificing comfort. The foam used in the shoulder straps and hip belt provide plenty of cushion to be comfortable from sunup to sundown. The composite frame sheet provides plenty of structure too, keeping your back happy throughout the day. The pack retails for $210, but you can buy one directly from their website for $129. Packs in this price range and size are rare. One of the very few is the ULA CDT 54L pack. It too is a frameless pack, but only weighs 24 ounces and costs $145. But unlike the Backpack Light 50L, the max load for the ULA is only 18 pounds. Other packs in this category – such as the HMG Windrider 55L, Gossamer Gear Silverback 50L and the Zpacks Arc Blast 55L cost $100 – $200 more. When I received this pack I took it to one of the harshest environments I could think of – the California desert. Sharp, thorny objects like to poke and tear into gear in this part of the world, making it the perfect place to test this pack. I demand a lot from my gear, and this pack has exceeded my expectations thus far. The white Dyneema threads built into the fabric are three times stronger than Kevlar and 15 times stronger than steel. All this means that on developed trails, this pack will hold up well. After the desert, I took the Backpack Light 50L to Northern California, where I thought I would encounter more problems. On overgrown spring trails I thought the thin mesh side and hip belt pockets would snag easily and rip. But this hasn’t been the case. The mesh used in the side and hip belt pockets seem to be durable and the elasticity of the mesh actually helps prevent them from ripping. Like the main compartment, the drawstring closure on this pack is simple and effective. As is the extension collar, which can be rolled down to keep the elements out. 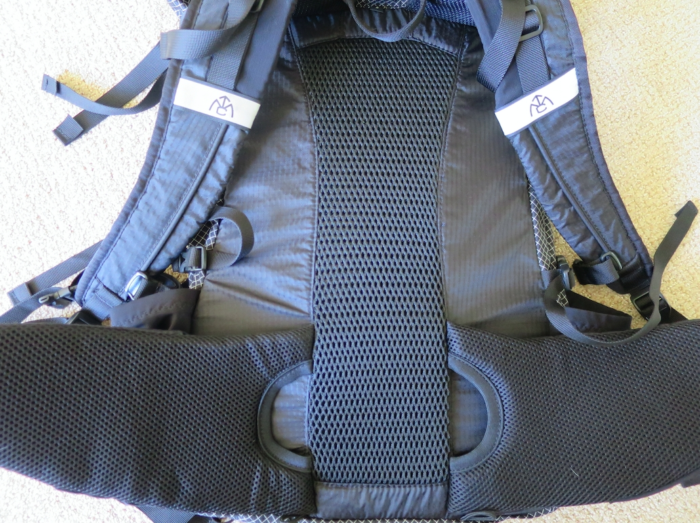 And ensuring everything stays in place is a top compression strap that runs over the pack. Supplementing the main compartment is the pack’s huge dual zipper front pocket, which is big enough to hold most items you’ll want access to throughout the day – snacks, tp, headlight, etc. The side pockets are tall enough to easily carry two SmartWater bottles each (more if on a really long waterless stretch). The dual compressions straps above each side pocket are a great feature because not only do they bring the load closer to the center of the pack, but they can be used to secure gear stored in the side pockets. Lastly, the Backpack Light 50L is relatively water resistant thanks to the polyurethane coating on the inside of the fabric and the DWR treatment on the outside. 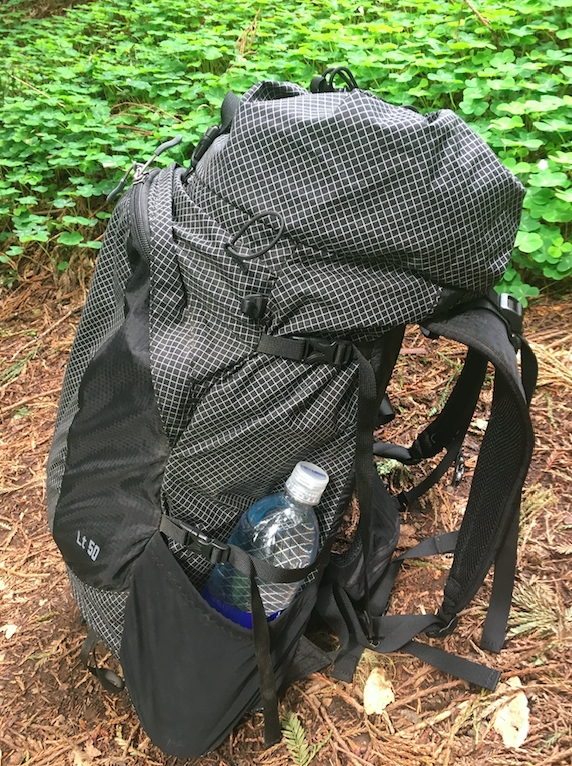 This pack isn’t fully waterproof as water can still enter through the zipper and stitching (and the top if you overfill it and are unable to roll it closed), so a rain cover or trash compactor bag is a good idea. The Backpack Light 50L is very clever and serves as two packs in one. It will haul your gear to camp and be your companion the next day as you leave your gear behind to summit Mt. Whitney. It accomplishes this with two loops and tabs strategically placed at the bottom of the pack. When joined together, they compress the pack’s volume and turn it into a peak bagger in seconds. The My Trail Backpack Light 50L is a very well though out pack, but it isn’t without fault. While My Trail claims the Backpack Light 50L can carry up to 40 pounds, I was able to comfortably carry only 25 pounds. To carry more weight this pack would require a proper suspension system. Like most ultralight packs, the Backpack Light 50L rests directly against your back. So even with vertical air mesh lining the center of the pack, there is little air flow. Before I condemn the hip belt pockets on this pack, it is worth noting that they have a second, smaller inner pocket to store small, valuable items. That being said, I’d prefer the hip belt pockets to be made of the same fabric as the rest of the pack to protect its contents from weather, dirt and for added durability. The My Trail Backpack Light 50L is only available in black. For those looking to customize their packs, you may want to look elsewhere. ULA offers their packs in many color combinations, but let’s not forget that for many years they only offered one color combo. 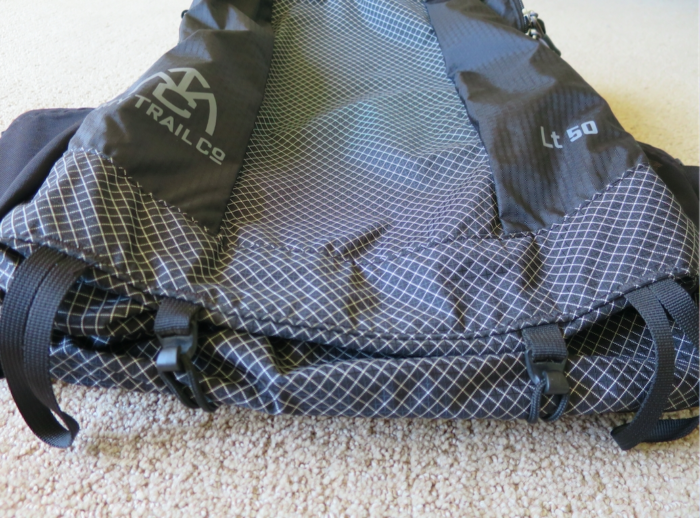 The My Trail Co Backpack Light 50L is a great all around ultralight backpack. The craftsmanship and construction is top notch. The features are really useful and the pros definitely outweigh the cons. This pack fits nicely in a gap that currently exists in the ultralight backpack market. 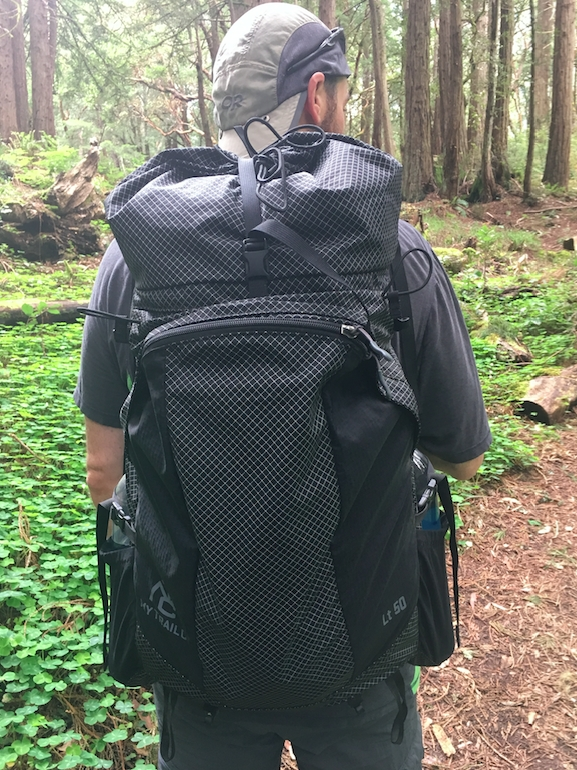 It’s spacious and lightweight enough for a thru hike and very well priced. Disclosure: the preceding product was donated for the purpose of this review. Why aren’t you mentioning that this is just a rebadged GoLite bag as MyTrailCo is pretty much the same company risen from the ashes of GoLite and run by the same people. The info about GoLite and My Trail is readily available. My focus for this review was to highlight the key features of this pack.